When negative comments are made about public art, they usually revolve around the art being unattractive, too permanent, or a waste of city funds (either for commissioning a sanctioned piece or cleaning up an unsanctioned one). But two different public art projects in France are capturing attention and imaginations with their simplicity and impermanence – and they use a material that’s highly unexpected. 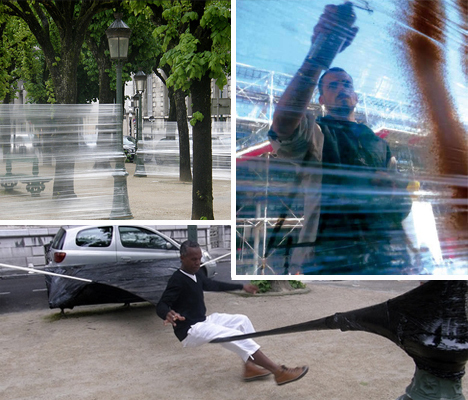 French artist Cedric Bernadotte wanted to figure out a new way for humans to interact with the urban environment. 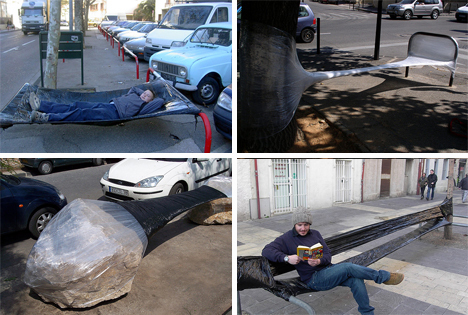 He believes that stopping to rest and enjoy a few quiet moments is essential for one’s enjoyment of the city. 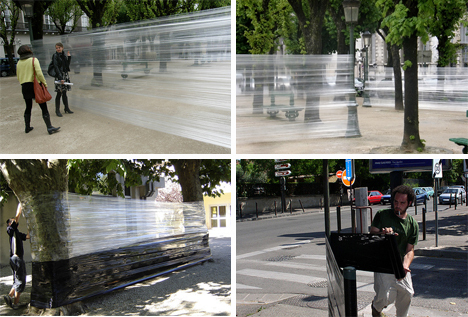 He accomplishes his goals with the creative use of cellophane, industrial tapes and inflatables. Using the type of sealing plastic that’s used to secure pallets, Bernadotte invents new spaces using existing city objects. Stretching from one signpost to another, bridging the empty spaces of a public art sculpture or simply closing the gap between two large rocks, his created objects are an experiment in public versus private space. They are often chairs or benches, made of nothing more than strong plastic, maybe some tape, and a great deal of curiosity. It’s amazing to watch the faces of passers-by light up when they see an unexpected place to perch momentarily. A swing in the middle of the city adds a touch of whimsy to anyone’s day, and a hammock in the sun provides the perfect spot for a mid-day nap. But most impressive of all is the fact that every piece of Bernadotte’s Street Interventions project is ephemeral; existing only temporarily and leaving no trace when it’s gone. 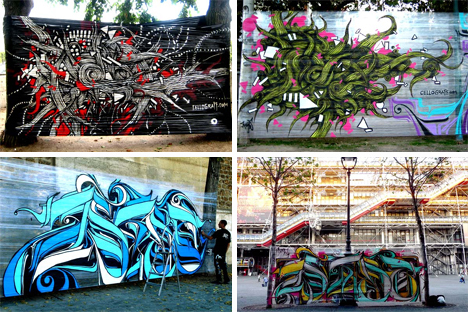 In 2006, three art students joined forces in France and formed Poetically Correct. 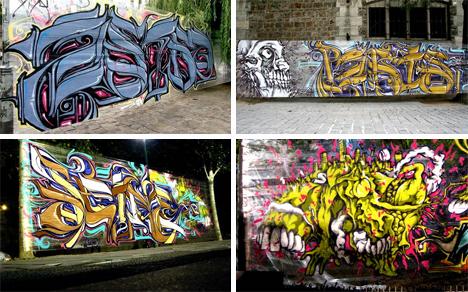 The group eventually changed its name to CelloGraff and lost a member, but gained a compelling idea: why not decorate the city with graffiti, but in a way that would hardly be objectionable? Their plan: transient graffiti that would be as elaborate and artistic as they want, but which disappears within minutes when needed. To achieve their vision, the artists turned to cellophane. Much like Bernadotte, they wanted a material that was cheap, readily available, and would leave no sign after it was removed. They stretch temporary canvases between trees, signs or whatever is nearby. They partition off small pieces of the urban landscape for themselves. And then, they paint. They create huge pieces that would rival most graffiti artists, but they aren’t out to tag up the entire city. 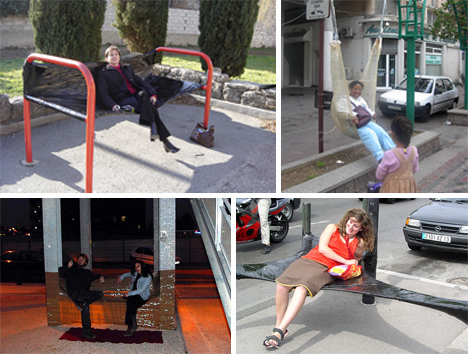 They are interested only in the transience of their interactions with the urban environment. 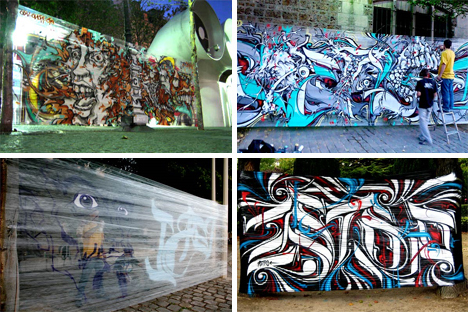 In this way, the artists, known as Astro and Kanos, call into question many ideas about graffiti. Other artists have shown that it’s more socially acceptable to paint on canvas than on city walls, but graffiti artists who only paint commissioned pieces tend to lose the respect of some peers as well as the visibility that comes from painting in public places. Astro and Kanos bridge that gap, leaving their graffiti (and their CelloGraff logo) to the public eye but doing it in a way that (mostly) respects the laws and statutes of the area.